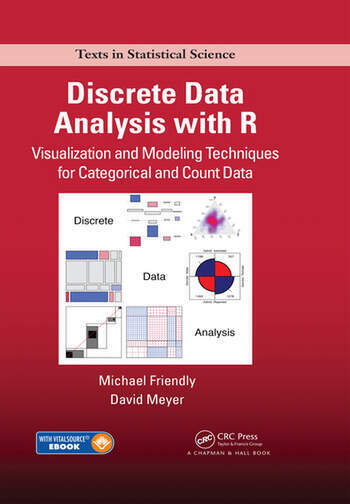 Discrete Data Analysis with R: Visualization and Modeling Techniques for Categorical and Count Data presents an applied treatment of modern methods for the analysis of categorical data, both discrete response data and frequency data. It explains how to use graphical methods for exploring data, spotting unusual features, visualizing fitted models, and presenting results. The book is designed for advanced undergraduate and graduate students in the social and health sciences, epidemiology, economics, business, statistics, and biostatistics as well as researchers, methodologists, and consultants who can use the methods with their own data and analyses. 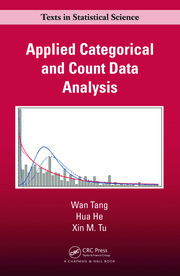 Along with describing the necessary statistical theory, the authors illustrate the practical application of the techniques to a large number of substantive problems, including how to organize data, conduct an analysis, produce informative graphs, and evaluate what the graphs reveal about the data. The first part of the book contains introductory material on graphical methods for discrete data, basic R skills, and methods for fitting and visualizing one-way discrete distributions. The second part focuses on simple, traditional nonparametric tests and exploratory methods for visualizing patterns of association in two-way and larger frequency tables. The final part of the text discusses model-based methods for the analysis of discrete data. The data sets and R software used, including the authors’ own vcd and vcdExtra packages, are available at http://cran.r-project.org. A summary and lab exercises appear at the end of each chapter. Michael Friendly is a professor of psychology, founding chair of the Graduate Program in Quantitative Methods, and an associate coordinator with the Statistical Consulting Service at York University. He earned a PhD in psychology from Princeton University, specializing in psychometrics and cognitive psychology. In addition to his research interests in psychology, Professor Friendly has broad experience in data analysis, statistics, and computer applications. His main research areas are the development of graphical methods for categorical and multivariate data and the history of data visualization. He is an associate editor of the Journal of Computational and Graphical Statistics and Statistical Science. David Meyer is a professor of business informatics at the University of Applied Sciences Technikum Wien. He earned a PhD in business administration from the Vienna University of Economics and Business, with an emphasis on computational economics. Dr. Meyer has published numerous papers in various computer science and statistical journals. His research interests include R, business intelligence, data mining, and operations research. "This is an excellent book, nearly encyclopedic in its coverage. I personally find it very useful and expect that many other readers will as well. The book can certainly serve as a reference. 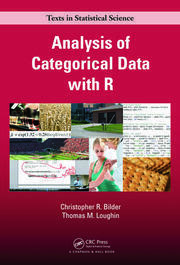 It could also serve as a supplementary text in a course on categorical data analysis that uses R for computation or—because so much statistical detail is provided—even as the main text for a course on the topic that emphasizes graphical methods."